Come see why people consider us the best place in Houston for kids parties! trampolines, pit, bounce mountain and obstacle courses, our professional staff will be there to take care of every detail of your party.The entire gym is reserved exclusively for your birthday party! 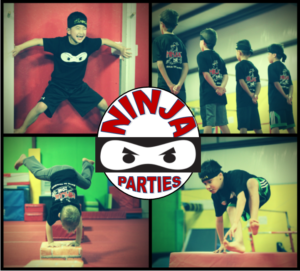 20-30 minutesorganized NINJA games, NINJA skills and NINJA instruction that incorporates NINJA FUN & NINJA FLIPS! VAULT, BARS, BEAM, FLOOR, TRAMPOLINE, RINGS and MORE! Every “ULTIMATE PARTY” child will receive a NINJA HEADBAND! The next 30 minutes will be spent in our lobby. Here, our staff caters to you and your guests serving food, beverages, and cake. The best part is that we clean everything up afterwards so you are 100% free to focus on enjoying the party and your guests. K2 Academy will exceed your expectations and provide each child and their guests with the best possible party experience by maintaining a fun, safe, and exciting atmosphere.